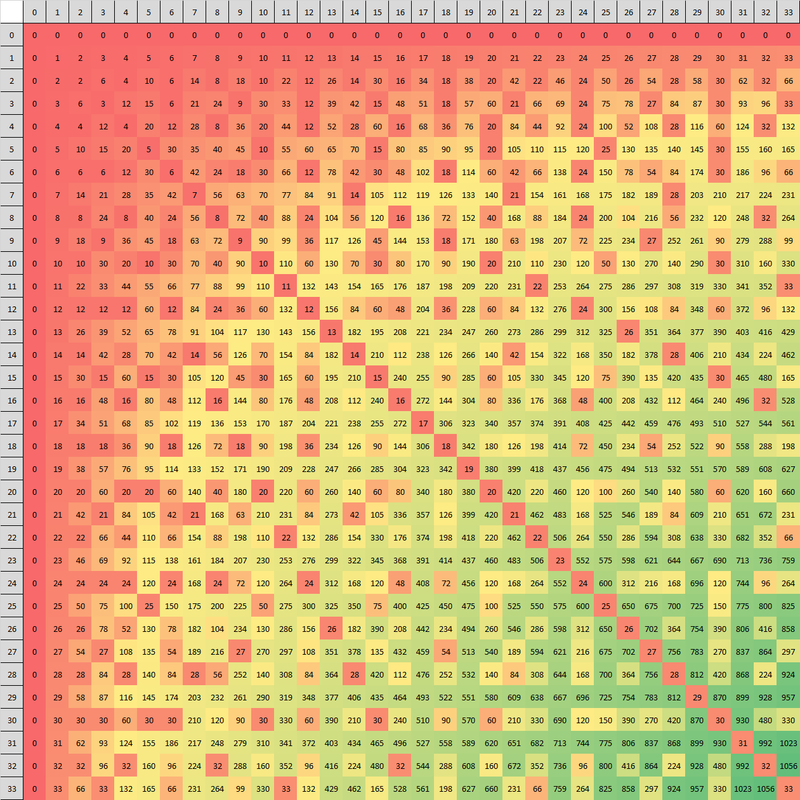 Lowest Common Multiples - Not such a pain anymore! I'm sure throughout your child's life, you remember a point at which they were learning about Lowest Common Multiples (LCM's), or as they're known when studying fractions, Lowest Common Denominators (LCD's). Although they are possible to figure out in one's head, very slowly, you can also figure them out using a multiplication chart. So, as one of my students and I were recently printing out a new copy of a 30 x 30 multiplication chart, we discovered this gem........... yes, it really is...... a LCM/CLD CHART!! Although I couldn't find who actually made it up, and I couldn't find the original place on the website where this lovely chart was posted, I am thoroughly thankful for it, and have linked the address where I found it (thanks to a Google Image search). 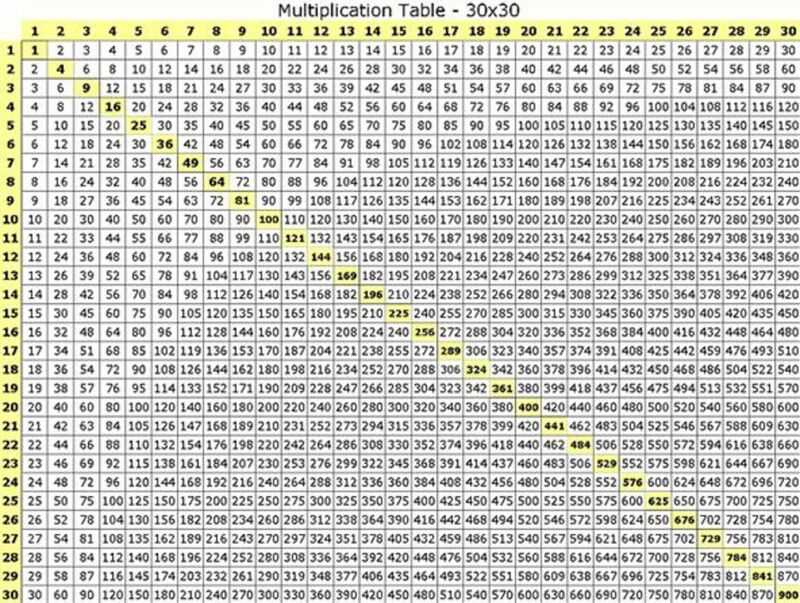 Also, in case you're wondering, there is a great set of multiplication charts that I use and will include them below (click on the image for the link to the image, or the website where possible). In a class where students are not allowed calculators, multiplication tables are generally allowed. So far, students of mine from grade 6 up have been allowed to use them in the classroom, so they might be worthwhile printing out for you too! They also look pretty snazzy in a sheet protector as well (kids enjoy using their pencils to follow the lines to the product). I've mentioned this website before, but I'm going to show you how to access it again! Follow along to get to some cool resources including videos (aligned with your course textbook), quizzes and online live tutoring! It covers Math 4 and 9, as well as most core grade 10, 11 and 12 courses!! I can give you my login information so you can try it out (just send me an email, message through facebook or text message). Setup your own free account afterwards if you want to use this often! These are the courses that offer videos, quizzes or Live tutoring for your grade! Here, I clicked on the Yellow Checkmark for Foundations of Math 11. Here, you see there are a variety of lessons. Just click on the lesson you're currently on and you can watch a video instruction lesson as well as examples. Such a great resource!! As I said above, if you would like to see what it's like for yourself, please contact me and I can give you my username and password to try out. Its also very simple to set up your own account. Often a parent account is easiest as you don't need the PEN number for your student! *note, there should be no 'y' instead it should be a '7'. Thanks to Pinterest for this fun post! Welcome everyone to the new school year! I am excited to announce our new Creatures of Curiosity programs for this fall. The first one starts on September 27th, so act fast!! The second new program is to help those taking Math 10! As last years demand for homework-help in Math 10 was high, we now have this new 'homework club' program! As well, for new clients, here are the Fall 2012 Tutoring Specials we are offering!